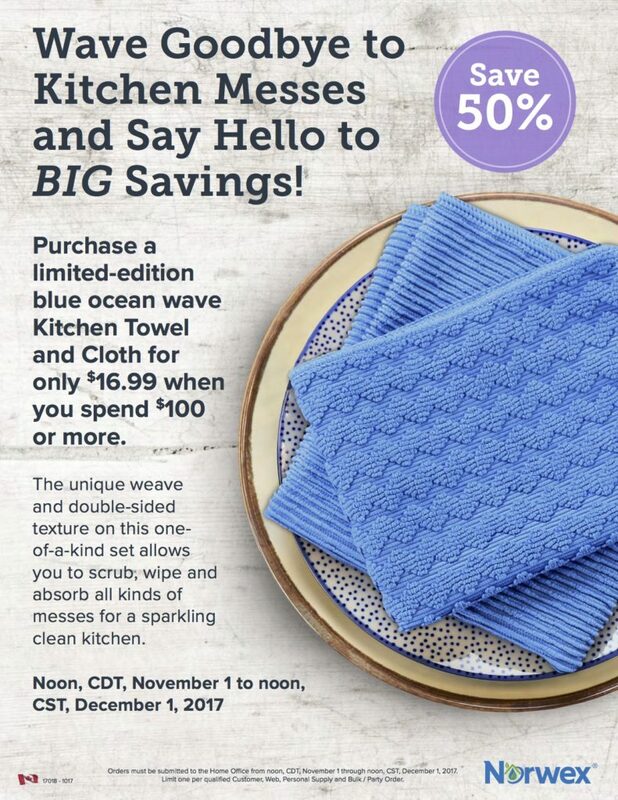 What’s on Special at Norwex in November? ‘Tis the Season for Savings! It is November and that means that Christmas is just around the corner. Wouldn’t it be fun to fill your adult kids’ stockings with more than just chocolate? 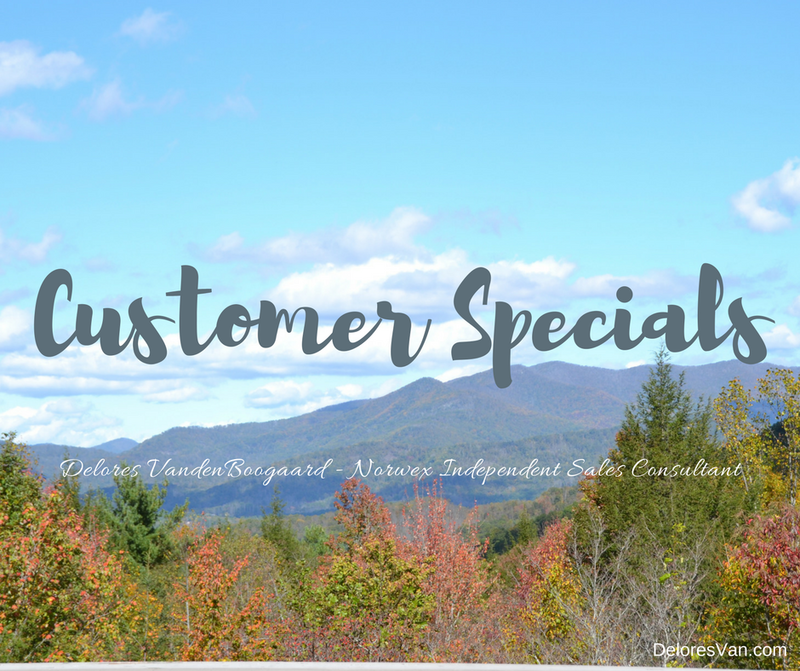 The Norwex Customer Specials could totally fill a stocking or gift bag with a practical, eco-friendly, all-natural, environmentally-friendly gift this Christmas. 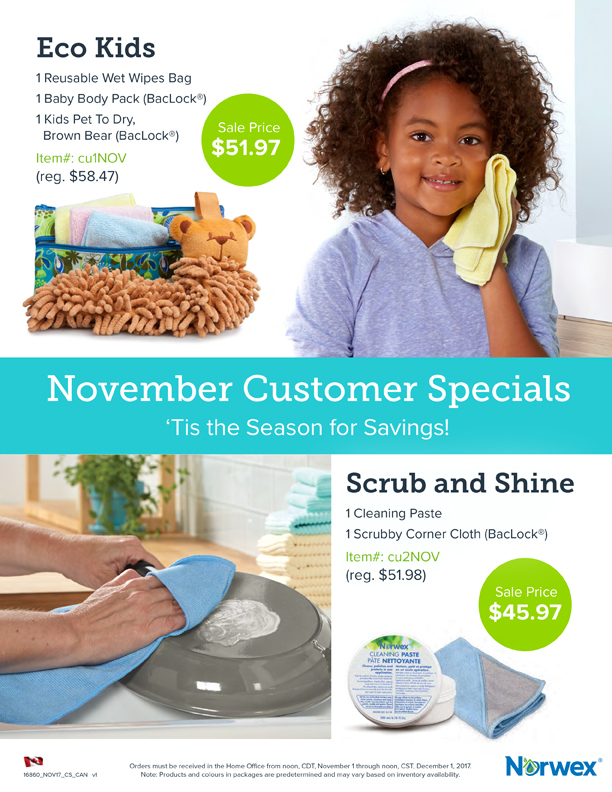 Norwex has some great items on sale this month… some products for your kiddos and some of the top-10 selling products. Protecting our families and our kids from exposure to chemicals in our homes is Norwex’s mission. 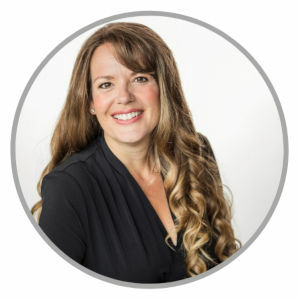 I love being part of their mission and educating people about how to protect themselves. This special is for your kids, or your sister’s kids or your grandkids. Baby Body Pack with Baclock™ – These cloths are constructed out of super-gentle microfiber to pamper your baby’s skin. They are perfect for their delicate skin and can clean them from head to toe, with just water. They have Baclock™, the micro silver agent in the cloth that goes to work with self-purification properties against the mold, fungi and bacterial odor within 24 hours so that it is ready to use again. The pack comes in 3 sweet pastel colours so that you can designate one for cleaning your baby’s gums, one for your baby’s body and the one for his bottom. They can completely replace/reduce the need for chemical-laden wipes. Reusable Wet Wipes Bag – This handy bag will allow you to take dry or damp Baby Body Pack cloths on the go. 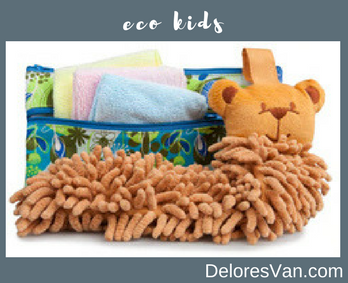 It is water-resistant, has a front pouch for clean cloths and a larger pouch for soiled/wet cloths and is a perfect size for your purse or diaper bag and is washable. Did you know? Disposable Wet Wipes are the on of the most common consumer items in our landfills, making up 30% of non-biodegradable waste. Kids Pet to Dry – Brown Bear with Baclock™ – This cute and irresistible hand towel will encourage your kids to wash and dry their hands in the washroom or kitchen. It has all the good stuff, including; super-soft and absorbent chenille microfiber, Baclock™ micro silver agent and they are quick to dry. I wish these were around when my girls were little, such a fun way to teach an important lifelong good habit. Did you know? In order to kill the harmful bacteria on our hands, you need to scrub with soap and water for 15-20 seconds. 95% of people don’t wash long enough and only 2 out of 3 people use soap. Cleaning Paste – This is one of my top-10 sellers. 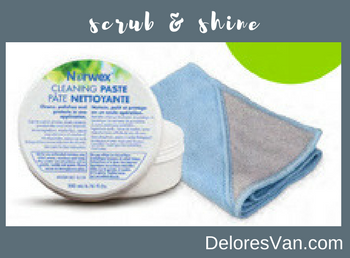 Norwex accurately describes it is “elbow grease in a jar”. It is made of three active ingredients, including, marble flour, natural soap and traces of coconut oil. It cleans, protects, and polishes in one application. You only need to use a dab of paste with a damp EnviroCloth and it will clean a variety of stuff around your home. To read more about how versatile the Cleaning Paste is, read this post. Did you know? The tub of Cleaning Paste will last at least a year on average!!! Scrubby Corner Cloth with Baclock™ – This cloth is constructed just like the EnviroCloth. It is made of microfiber that is 1/200th the size of a human hair, it has Baclock™ self-purifying agent, is absorbent and has the ability to clean up to 99% bacteria from a surface when following proper care and use instructions. But what is different is that it has a handy little scrubby corner. Why, you ask? When you use an EnviroCloth to clean all your surfaces, you are bound to come across sticky spots or dried-on food that need a little extra scrub. When you use this cloth, it is already attached and ready when you are. In my experience, it is a great cloth to clean toilets. All those little nooks and crannies are easily cleaned with a little scrub and then wipe down. When used with the Cleaning Paste they can tackle anything. So now you know the Specials for the month! The more we know about the personal products we use, the better choice we can make. I love that Norwex is always providing options for people to reduce the use of chemicals in their life, and their kids’ life. Try them for yourself, or get started on your Christmas list.